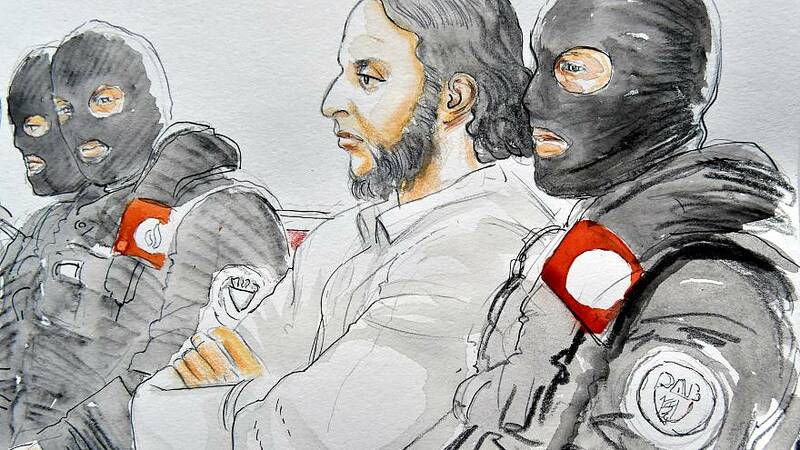 The sole surviving suspect of the 2015 ISIL attacks in Paris refused to answer questions when he appeared at the first major trial in connection with the investigation in Belgium. Salah Abdeslam, 28, faces murder charges in connection with a gunfight that led to his arrest in Brussels. His long black hair and beard were in stark contrast to the cropped, clean-shaven man familiar from police images. It was the first time the French national, who was born and raised in Belgium, has appeared in public since the November 2015 attacks. The 28-year-old is charged, along with another man, with wounding Belgian and French police officers who raided a suspected hideout in Molenbeek in Brussels on March 15. Abdeslam was arrested after a further police operation in the Brussels neighbourhood of Forest days later. Bomb attacks at Brussels airport and on the city's metro came days after his arrest. Thirty-two died. Apart from answering a few questions, Abdeslam maintained his silence in court. During an initial session, his alleged accomplice admitted to having fought for ISIL in Syria and said both accused were present during the March 2015 shootout with Brussels police. The judge asked Abdeslam to speak. Citing his right to silence and declaring his Muslim faith, he accused the media of condemning him before his trial: "Judge me. Do as you want with me," he said. "I put my trust in the Lord (Allah)." He urged the prosecution to base the case on forensic evidence and "not swagger about to satisfy public opinion." "Muslims are judged and treated in the worst kind of ways. They are judged without mercy. There is no presumption of innocence." The refusal to engage with the court may leave many disappointed. Some are hoping Abdeslam may end more than two years of silence to give some idea of how and why the Paris attacks took place. He became Europe's most-wanted man after CCTV footage showed him returning from France the day after a wave of coordinated gun and suicide bomb attacks at the Stade de France, bars, restaurants and the Bataclan concert hall across Paris in November 2015. That night 130 people were killed. His brother was one of the group thought to be behind the attacks. Abdeslam was not traced for four months, despite a wide-ranging police search. He was detained in a raid in the western Brussels district of Molenbeek. Security is tight around the 10th century Palace of Justice courthouse complex, which dominates the skyline in the centre of Brussels. Patrols are also visible on the streets of the Belgian capital and in the city's metro stations. "These are undeniably tough security measures but they are simply the consequence of the police's assessment of the security need for the trial," said Luc Hennart, president of the French-speaking Brussels court of first instance. What do the Brussels charges relate to? Abdeslam and another man are charged with wounding Belgian and French police officers who raided a suspected hideout in Brussels on March 15. Three days before his arrest, prosecutors say Abdeslam was one of three men holed up in an apartment in the southern Brussels district of Forest. Four police officers were wounded. A suspect armed with an assault rifle was killed. Prosecutors say Abdeslam and another man fled the scene. The French national, who was born and brought up in the Belgian capital, is accused of "attempted murder in a terrorist context" over the Brussels shootout in March 2016. He will be ferried daily from a prison in France under heavy security to the main courthouse in Brussels. Why is Abdeslam in prison in France? The 28-year-old faces trial there over the 2015 attacks in Paris. What about the Brussels attacks? Prosecutors also believe Abdeslam was an associate of the three men who blew themselves up at Brussels airport and on the city's metro system on March 22, 2016. The attacks came four days after he was arrested close to his family home. "He is facing a sentence of up to 40 years in prison in relation to this," — Luc Hennart, president of the French-speaking Brussels court of first instance. "The question is, are there other sleeper or active cells preparing attacks in Belgium or France? That is the risk. It has been there since 2015 and 2016 and continued until the end of 2017. There were arrests all the time. This proves that the terrorist structures are still in place or that there are radicalised individuals who could create them," — Claude Moniquet, co-founder of the European Strategic Intelligence and Security Centre. "He won't get off by staying silent. I think it is in his interests to give us answers. It is one thing if he does not want to answer questions from the prosecution, but he should reply to questions from the victims. It is the victims who are waiting for answers from him," — Blay Mokono was injured during the attack on the Stade de France in Paris.